The ports of Wii game No More Heroes won't take advantage of either the upcoming motion controls for either the 360 or the PS3. In an interview with Edge, Marvelous Entertainment chief Yasuhiro Wada said that No More Heroes: Heroes Paradise is still being developed, despite Ubisoft stating that they will not publish the game. Feedplus Entertainment is porting the Wii title to the HD consoles, and is starting from scratch with many models to improve the graphics. Wada said that the port will not utilize "uncommon new technology" involving motion control on the Xbox 360 or PS3. Controlling the sword-wielding character in No More Heores with the Wii Remote was a big part of game's appeal. When asked whether Heroes Paradise will make use of Natal on the Xbox 360, however, Wada confirmed that only the analog controller will be used. "Since the concept for the remake is to bring the game to a wider audience, we aren't currently considering to use uncommon new technology. Basically everything will be controlled using the analog controller," he said. "We are reworking the control scheme to improve the sense of being in the game." 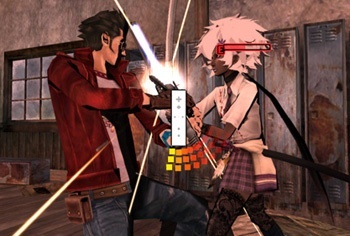 As to whether or not the decision to port No More Heroes was because of poor sales on the Wii, Wada said, "I am satisfied with the sales of the Wii version to a point, but I don't think that it really proves the limits of Wii. Monster Hunter Tri is selling well on the Wii after all, but we just are not able to create that kind of content at the moment. To be clear, I'm not admitting defeat. I am constantly striving to ever make better games." When asked about Ubi deciding not to publish the port, Wada appeared to dodge the question by saying, "I think what Ubi announced was that it intends to focus on promoting [the sequel] No More Heroes: Desperate Struggle." Wada did not state if he had found a publisher for Heroes Paradise outside of Japan.